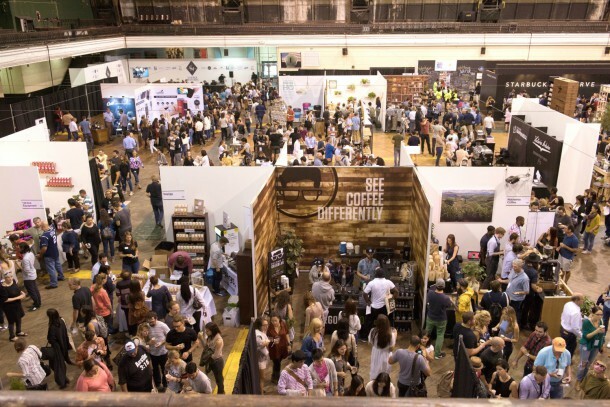 Heads up if you’re in New York, the NY Coffee Festival is in town again with public sessions open from Sep. 17-18 at the 69th Regiment Armory. A number of quality focused cafes, roasters, and related companies have booths (Toby’s Estate, Counter Culture, Devocion, Chemex, La Marzocco, Curtis, Alpha Dominche, Joe Coffee, etc.) and there are a range of interesting program features. A $20 ticket gets you a 3-hour session to take part in free coffee tastings from all the exhibitors, competitions and presentations from coffee industry folks, and more. “Judged by a panel of industry figureheads, the fast-paced knockout battle format of Coffee Masters will see 16 baristas showcase their skills head-to-head across a broad range of disciplines: Cupping, Brewing, Latte Art, The Order and The Signature Drink, with The Espresso Blend being included for those who successfully make it to the Coffee Masters semi-finals.” Read more here – and check out the videos from each competitor! Demonstrations of home coffee brewing techniques, and educational presentations, a few notable speakers include Andrew Miller of Cafe Imports (a green coffee importer), and Emily Rosenberg of Stumptown. More info here. Four interactive work stations let you get hands on time with La Marzocco’s home espresso machines – the Linea Mini and the GS3. Apparently they’ll also be serving signature drinks. More info here. Food and drinks will be available for sale from a “Street food market” with vendors like Bluestone Lane serving avocado toast. And there will be an espresso martini bar serving cocktails, along with the promise of craft beer, if you need something to help level out all that caffeine. Sounds like there will be more than enough to explore for 3 hours! Looking for Instagram Research Participants! What an amazing celebration of coffee culture. Next time, they should add some more interactive games with visitors, maybe a tasting competition or amateur barista competitions for people. Awesome post, and such a great festival. There are so many ways coffee can be brewed and served. The NY Coffee Festival sounds like a informative good time. I can’t wait to go and see it for myself! A great coffee festival celebrated in NewYork. Actually, I am searching for a new coffee machine and I found this new one called Orca Coffee (https://www.orca.coffee/) Anyone heard about them? It seems nice…the coffee is from italy and the machine is for free but, despite how interesting it is, i would like to know someone’s opinion before getting one for my house. An amazing coffee festival. Wish I could participate and network with coffee fanatics.